So as I mentioned last week I’ve been quite luck in the last few weeks and one of the other prizes that I won was two spots at Yelp London’s event at Zoe’s Ghana Kitchen. Interestingly enough I’d actually received a press release about the kitchens opening and was keen on going but as it was in Clapham I decided against it. Fate it seems had another idea and so last Tuesday I found myself in Clapham Common for the first time waiting for my friend Michael to arrive. Having never tried Ghanian food I was a both a little nervous and excited but mostly looking forward to trying things that I wouldn’t normally have ordered – that’s the beauty of a tasting menu. There were a few more people than expected so we ended up a little squished but that just meant we got to know each other a little bit faster. 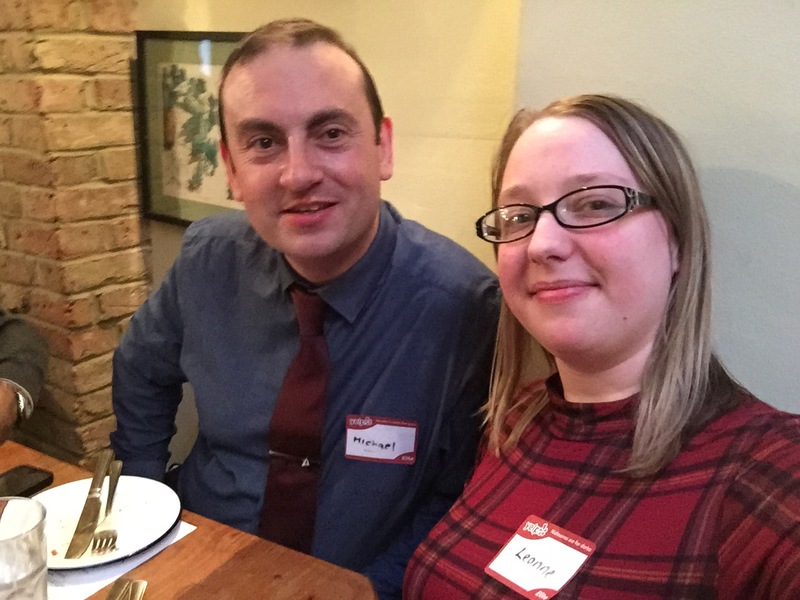 I was pleased to see that one of the other competition winners was also at the table and didn’t have a clue what a Yelp Elite was either! After getting some drinks it was time for the food. To start we were served the Okra Tempura with shito hot pepper sauce (I was a little confused as for some reason I had a dairy free menu which wasn’t quite the same but I got there in the end!) these tasty little bites were packed full of flavour and left a bit of afterburn which was just delicious. They were so moreish I’m sure I had more than my fair share. 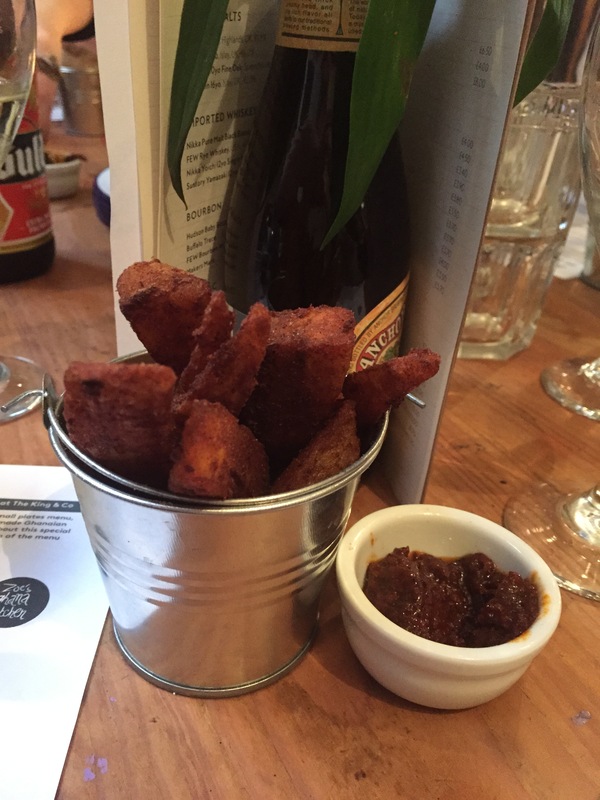 Next up were the Kelewele chunky plantain chips which were a bit firm for my taste but went really well with the spicy sauce that was served with it. They also went well with the red red beans, a traditional Ghanian dish which while better than regular baked beans just weren’t my cup of tea. Then it was time for the mains. 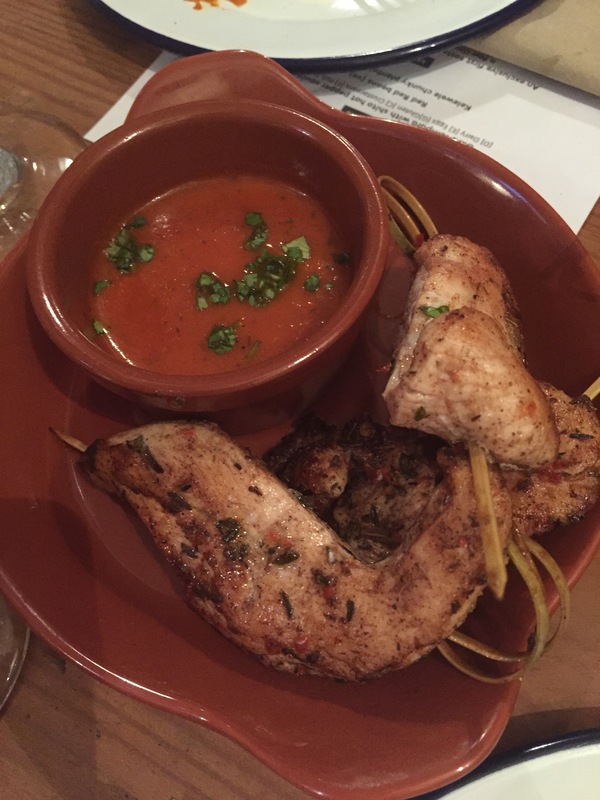 The Jollof Chicken Skewers were succulent but not overly flavourful, I guess this was to make room for the kick from the sauce which was a bit too hot for me personally. Although it went magnificently with leftover sauce from the peanut butter stew! 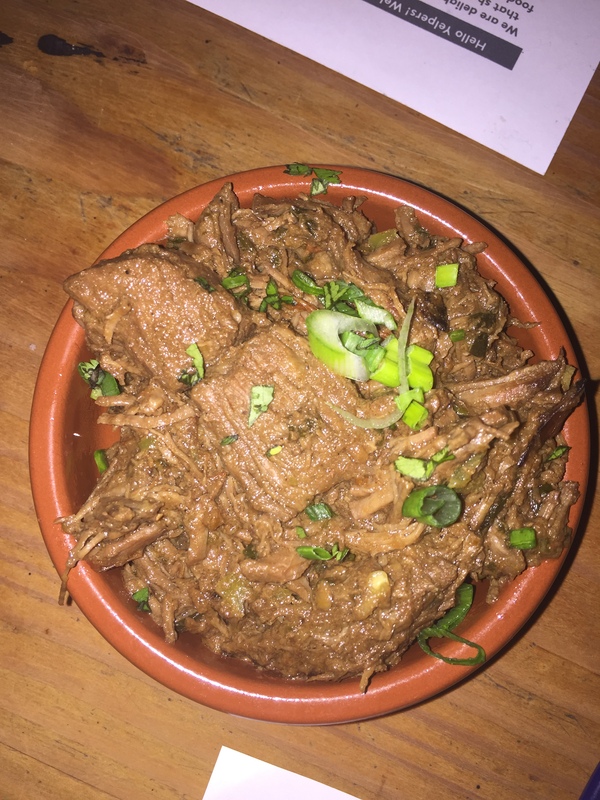 The peanut butter mutton stew is Zoe’s signature dish and what started her career as a chef back in 2011 when she decided to cook it as part of the Hackney Wicked Arts Festival and it continually sold out each day! This was my first time ever trying mutton and I have to say I could take it or leave it. I didn’t find it particularly flavoursome but it didn’t taste bad either. The Hearty Beef, Spinach and Ginger Stew however was the absolute winning dish of the evening for me, which coming from a chicken and fish lover, is saying something. 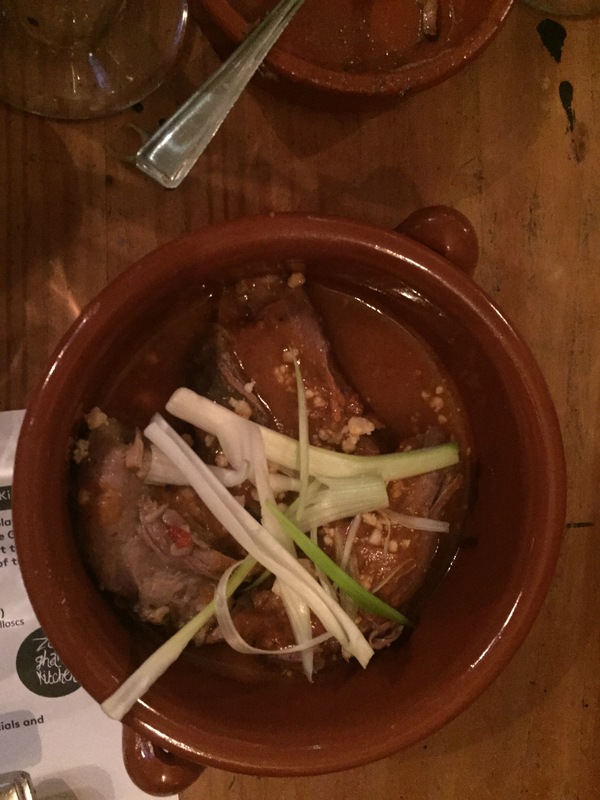 The meat literally just melts in your mouth and every bite is packed full of wonderful flavours. Just thinking about it is making my mouth water! 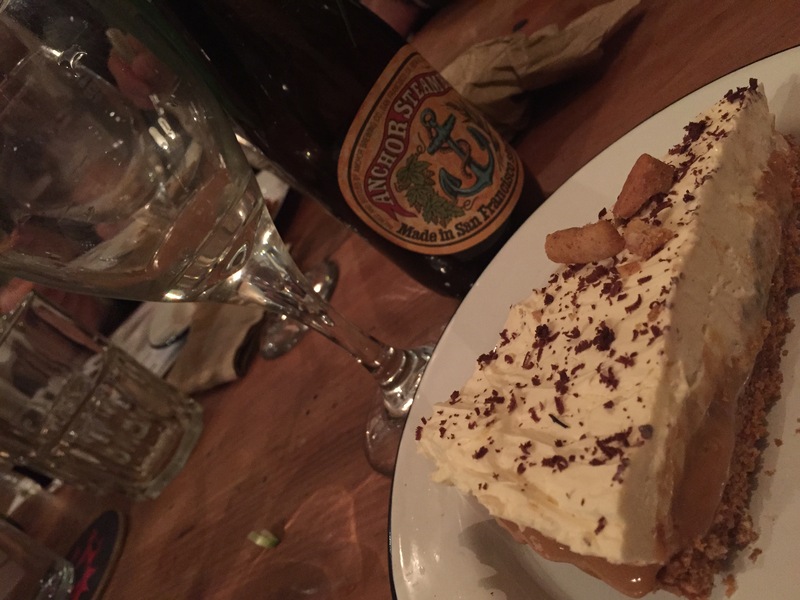 Finally we were treated to the “Love Chin Chin” banoffee pie which I’m still dreaming about a week later! Love Chin Chin is a West West African sweet snack that crunches like a biscuit but tastes like a cake and formed the base of the pie. It tasted nice on its own but when combined with the banana and the cream? Oh my god. I could have eaten two slices of this by myself no problem. So, so good. Promise you’ll try it if you go? 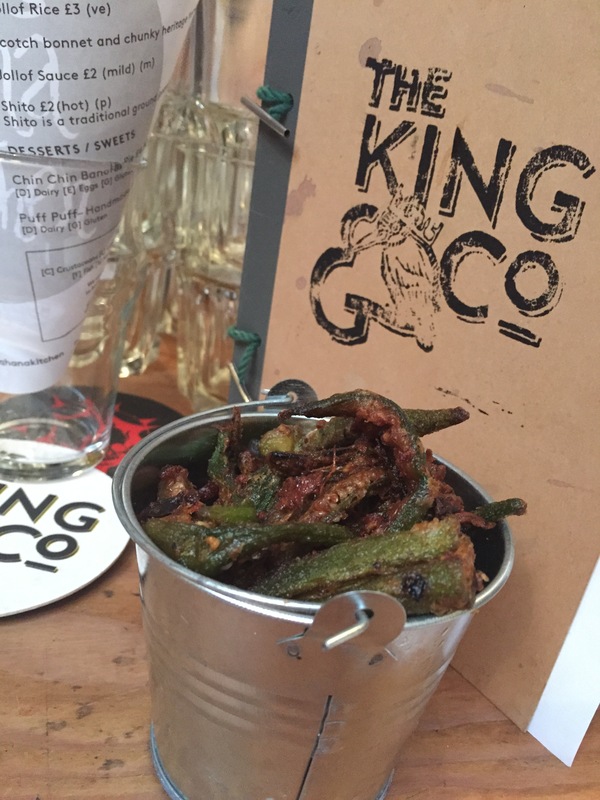 Zoe’s Ghana Kitchen is being hosted at The King and Co until the end of May and is well worth the trek south of the river. If the regular menu offerings don’t tickle your tastebuds she’s also putting her own spin on brunch at the weekends and a roast on Sundays! That cake looks yummy, and I love the sound of the peanutbutter stew! Congrats on winning 🙂 See you later! !